Incredible light weight vs lifting capacity, our AU08A series combination lift beams are the perfect solution for those who require a strong lifter without the heavy weight. The top pad eye of these beams allows for various locations to be utilized, offset CG situations, and even additional top rigging should the user prefer. The bottom pad eyes provide a variety of rigging locations. Each beam is supplied with a single top shackle (BTAS) and two bottom shackles (BTAS). 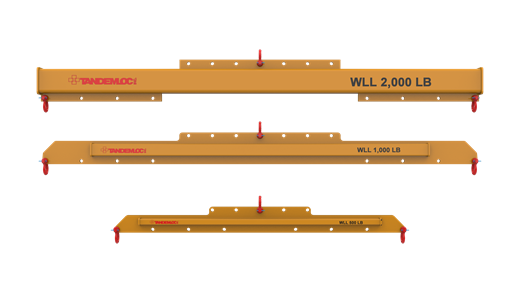 True to the Tandemloc brand, each combination lift beam is designed and manufactured to current ASME B30.20 and BTH-1 standards and proof tested to 125% of the Working Load Limit (WLL). For specific information on available and/or custom sizes, please refer to the chart below or contact our Sales Department at 800-258-7324.